LET US KNOW IF YOU CAN MAKE IT. YOU MAY ATTEND EVEN IF YOU ARE NOT CURRENTLY ON COURSE, OR ARE ON COURSE AT ANOTHER ORG. If I had seen this 10 years ago I would have taken it for a joke. This is not an “interfaith meeting”. This is GRADUATION where people are supposed to “give wins from all levels of the Bridge”. 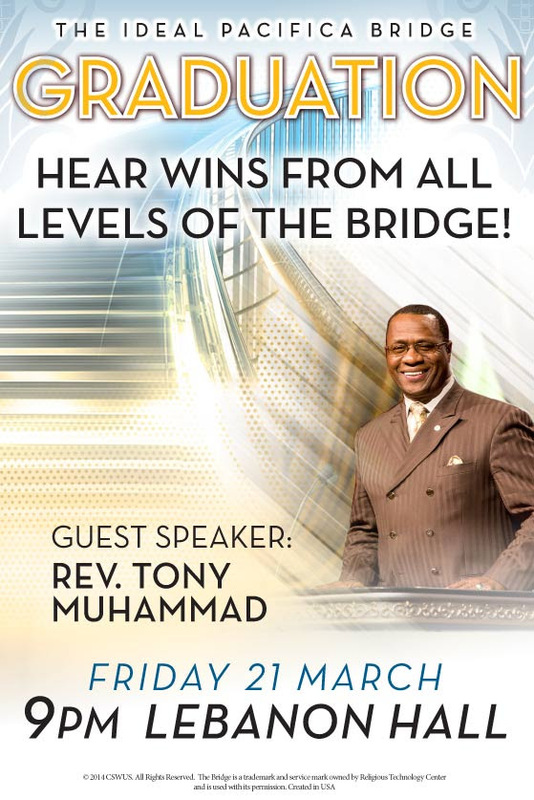 The “western leader” of the Nation of Islam is the “guest speaker” and this is supposed to be good news? If there was a “guest speaker” at “graduation” one would imagine perhaps a Senior C/S or a Senior Course Supervisor or maybe even the President of the scientology church. After all, this is the IDEAL Pacifica Bridge — the “model” for everywhere else in the world. How mixed up and weird can things get? How incestuous is the relationship with the Nation of Islam these days? I bet this is all a one-way flow. They send their honchos to preach to scientologists and the church doesn’t send anyone to do anything with them — because there isn’t anyone even allowed to speak on behalf of the church these days, but more importantly because the NOI congregation would revolt if some outsider showed up at their “graduation.” But the Scierntologists just follow along with anything that is given them — this is seen as “proof” of the “growing international acceptance” being generated by the fabulous PR of the fundamentalist church. Tony Muhammad is an outsider imported to try and give some pizzaz to this most “internal” of all church activities. He is NOT being promoted as a “scientologist” whether he could be called one or not. He is not a “scientology minister” — he is “Rev.” (more correctly “Minister”) because of his position in the NOI. The “Ideal” Pacifica Bridge cannot generate enough excitement with the massive, unbelievable, unreal number of graduates rolling off the line with GAG II, so instead, they bring in an outsider who has more prestige than they have, and what a sad statement that is. Surely even some of the most brain-dead and cowed clubbed seals raise an eyebrow at this. The second graduation after the big even to be declared “Ideal” and they bring in a Nation of Islam leader to speak to the assembled students and pc’s at graduation. Wonder if they will be bring in guest speaker from the Westboro Baptist Church next? Or maybe a psych from UCLA? I heard Tony Muhammad speak a couple of times a few years ago. He said he LOVED his beautiful,blond, blue-eyed, female, CCI auditor. He said that his wife also loved his auditor. He raved about what his auditing had done for him. As I recall, he was on grade 2 at the time; I may be wrong about that. He was also getting training at CC. He talked about how much he LOVES LRH. He described how Louis Farrakhan and some other NOI’s were shown this quote in History of Man: “The whole track seems to be about 70 trillion years long.” (Chapter 7, paragraph 2.) This brought tears to their eyes. According to Tony, this quote aligned with teachings of the NOI. I consulted Wikipedia on the subject of NOI. The article states that the NOI teaches that the earth is some 76 trillion years old. I googled NOI age of universe and came upon an article stating that NOI founder Elisha Muhammad claimed the universe was 76 or 78 trillion years old. Tony M is a great speaker. He is charming, charismatic, and funny. He could make an effective Miscavology salesman. Weird. It’s really so pathetic. With all the outpoints in the early days, the wins of pcs/preots and well trained auditors were so prevalent, that the subsequent good will created decades of loyalty to the tech. Despite disorganization, confusion and incompetence, people worked their hearts out for the church, or financially or sacrificed other areas, due to the importance that spiritual gains were to them. This good will is at an end. No amount of unusual solutions are going to offset the intentional degradation that has gone on, hidden for several decades. Many brave people have and will continue to bring these evil deeds to light. DM, your 15 minutes of fame are up. Actually, a few people in the Independent Movement have bridged into the N.O.I. and are helping as consultants with tech and various. I myself would not A=A People in the NOI with Scientologists. They are not Scientologists, they are NOI members. They are not restricted from reading the Internet or confronting inconvenient truths. They are educated socially and informed. They know exactly what is going on. According to Blogmocracy. com, Scientology (David Miscavige) bought the NOI cult for 2.5 million. The so called “expansion” of Scientology under David Miscavige is a scam, just like his entire sordid business. I hope it won’t be long before his flimsy house of cards entirely collapses. Seems Malcolm made the mistake of saying that Kennedy’s assassination was a case of the “chickens coming home to roost” which got him excommunicated from NOI for some reason. Ron obliquely said the same thing himself in the article “What is Greatness”. Personally I wonder why this comment whether true or not would be so objectionable to the Nation of Islam which are basically Black Separatists. That is the other side of the coin to the White Separatists in places like Idaho who follow the “Turner Diaries” and believe the world will be taken over by ZOG (Zionist Organized Government) much like the Nation of Islam believes only they don’t call it that. It seems both aside from being racist are also anti-semitic to the extreme. Anyway Malcolm began to preach a more inclusive form of Islam which included all races after a pilgrimage to Mecca when he saw members of all races converging on the Holy City which was when he was killed by “Black Muslims” who some believe were members of the Nation of Islam. Needless to say that the Nation of Islam has a checkered past (fact is all religions do to a greater or lesser extent) yet NOI hasn’t changed their militant stance on Black Separatism nor reeled in their blatant antisemitism. Not that they haven’t had a salutary effect on members of their own race making many of them self reliant and independent like the American Indian Movement has had for “Native Americans” ( though many of my “Native American” friends eschew that politically correct name and prefer to be called just Indians) but unlike NOI, AIM says anyone can be a member of AIM no matter what race if you align with their goals while Nation of Islam’s membership I believe is limited to African Americans. Thus one wonders why the Church of Scientology would align itself with such a militant form of Islam (actually from what I understand Nation of Islam is an amalgamation of Christianity and Islamic faith where they don’t actually have imams or ayatollahs but ministers instead nor do they consider the Quran their sole religious text and include passages from the Bible as well) that preaches intolerance to a greater or lesser degree toward Jews and anyone who isn’t Black? Something enquiring minds would want to know. Moving on to something less serious. We in RTC wanted to have the Reverend Fred Phelps speak but he died. Phelps being dead, we had to go with Tony Muhammad because all of AOLA management is in Confusion for the statcrash following the grand opening of Ideal Pacifica. In happier news, COB was just named “World’s Greatest Ecclesiastical Leader” for the 22nd year in a row by Freedom Magazine. Rinder has been nominated for “Diamond Meritorious HERCULEAN Award with Honors” engraved on the largest bowling trophy on the planet. And I can’t think of a more deserving recipient, can you? He works tirelessly to pound some sense into his underlings and all he often gets is a stab in the back. Let’s hear it for the boy! Dave, According to Ortega, you just got blocked from building your retirement community with medical facilities in France. Hey Dave, ‘Graduating Scientology’ is about as straight up as it gets. According to Ortega, Corporate Scientology is HISTORY (on the History Channel) and according to “60 Minutes, Australia” you are TOAST. Graduation used to be all about making auditors, and that was all. Pc’s were announced too but they always thanked and raved about their auditors. Co-auditors especially. It was all about the TECH and the life/spiritual benefits it produced. I guess now it’s all about false PR hype and getting more money. Of course–what in the RC$ isn’t? I can clearly remember NOI occupying the 5th floor at CCI. I wonder if they still do today? — Through the 1970s and 1980s, 2-3 Scientology OTs were working with the US government, after convincing them that “OT phenomena” was real and measurable (see Puthoff and the SRI research). Could you imagine what a boon this would have ultimately been to Scientology, had the CoS management actually supported and nurtured this? Instead, in the 1980s the CoS, in its cultish ways, blew the two OTs off and they quit — distancing themselves from the CoS as far as possible. And today, the whole field of “remote viewing” (and the various universities and organizations that continue to study this field) want to have absolutely nothing to do with Scientology, letalone have their roots tied to it. — In the early 1980s, a highly respected psychiatrist and trained Scientologist (Dr. Frank “Sarge” Gerbode) worked to introduce dianetics and Scientology techniques into the field of psychology and psychiatry (see “metapsychology” and TIR). Instead of supporting and praising this, the CoS attacked the highly trained Scientologist (David Mayo) who worked with Gerbode, and the CoS management did their best to block this effort of integration. Imagine what could have happened if a normal management had been in place (and not a cultified one), that actually supported this type of effort? And there are so many other lesser efforts of actual and authentic attempts of integration of Scientology into society … especially in the 1970s … but because by the 1980s they were not in some way managed and controlled by the CoS management, they were sabotaged. And now today, we have Scientology management joining forces with the NOI. Which is really just the above on steroids, isn’t it? Instead of just sabotaging genuine efforts at integration, the CoS is now openly embracing a well-known extremist group and proudly showcasing this “alliance” as something to be proud of. If someone wants to make a case for how Miscavige is actively destroying Scientology’s reputation and reach into society, I don’t think one would have to look much further than the above examples. But of course there are many many others. Though I have a differing view on the whole RV program which in my opinion is that the relationship of the phenomenon to the original OT levels was not only obscured by the Church but in collusion with the IC as well. In the case of Sarge they definitely missed a opportunity there. (Fact is when I was first got into Scientology there where quite a few independent Psychiatrists, Psychologists and other Psychotherapists who had been recruited under the RED Project Psychiatry who were encouraged to continue their practices by integrating Dianetic Techniques and where actually contacted to handle any “type IIIs” that might have gotten on lines. In a project called “New Directions”. In my opinion if this program was continued that Lisa McPherson might be still alive today. But anyway when New management or as I call them the coup took over they went on a total jihad a against “psyches” and blew all of them off lines. Personally I had mixed emotions on this whole “going mainstream” game that was being played by management some time back by signing on heavy hitting PR Firms like H&K. My view is if you want to promote the indispensability of Scientology which was a big GO button at one time. You do it by getting good results on the public and nothing more. Not PRing people into believing you are indispensable which seems to be the course that the Church has taken these days. As far as aligning the Organization with extremist groups which includes Government Agencies like the DEA. Aside from being total idiocy it also violates the Policy on Politics Freedom From. When all is said and done NOI’s objectives are *political*. That’s a good point, Robin. I do think that from the 80s forward, nearly all the attempts at social integration were contrived and purely PR-based, and lacked true results-driven objectivity. And it seemed to start with the need for the CoS management to control and dictate everything. Actually I felt somewhat nauseous when the meme of “going mainstream” was first introduced by our idiotic oberfuhrers. Friend of mine told me that ABC was down at the complex filming something and the staff and public over there were running around like slavering publicity hounds. I just grabbed a peptobismal rolled my eyes and went back to what I was doing. 1) How by any stretch of the imagination could it have been considered workable for anyone to be required to do Dianetics?. (By “workable” I mean, “giving benefit to a person”.) How can one’s self-determinism to help oneself or others with Dianetics be bypassed and made a REQUIREMENT, and still deliver the help it is supposed to deliver. For, metered auditing or not, Dianetics is the entrance to the Bridge and it DOES address case, for crying out loud! De facto, doesn’t this peg all “requisite” Dianetic auditing at 1.5? 2) The NOI’s creation theories are not important. All religions have wacky beliefs; talking snakes, sun gods, Noah’s ark, living inside a whale for 3 days, Moses parting the Red Sea, Goddess of Love Aphrodite created from sea foam, virgin birth of Jesus,, Marcabs, Xenu, whatever, and on and on, and who cares? I personally don’t. I think its great that the NOI are learning TR’s and Study Tech. I’m for everyone learning TRs, Study Tech, the ARC Triangle, etc on their own determinism, and NOTas something they MUST do in order to maintain their standing in their own, original religion. I mean, where is THAT on the Tone Scale? 3) And what I find APPALLING about the NOI is NOT the group itself nor its people nor its stated purpose which I think is basically a good and healthy one, but their leader Farakkhan and his horrible, strident anti-Semitism. It really blows my mind that the Church of Scientology could even CONSIDER on one hand a public alignment with this extremely low-toned person who blames and publicly vilifies Jewish people, while on the other hand, it (the RCS) is busy trumpeting its support of human rights and tolerance. And, where is THIS on the Tone Scale? I agree with all three points of your rant. Probably would have been better if Farakkhan would have just recommended Dianetics or Scientology to his congregation and left it at that. But as we know both he and Miscavige are soul brothers as far as fascist mentality is concerned. For the Scientology organization to be joined at the hip to such an overtly anti-Semitic group as the Nation of Islam is an indication of just how desperate David Miscavige is to populate his empty buildings. For any Jewish Scientologists (an oxymoron, I know) to not question this unholy alliance is both disturbing, and indicative of a total absence of any moral compass. The hottest places in Hell are reserved for those who, in times of moral crisis maintain their neutrality. I was wondering how they were divvying up the revenue stream? does the CoS pay the NOI a ‘finder’s fee’ for new recruits, or does NOI pay CoS for using its ‘copyrighted religious technology’? It promises to be a GREAT graduation! Topics to be covered: the comm cycle in auditing; how the tone scale relates to ARC; and exactly when the Mother Wheel Spaceship will be picking up all of Earth’s inhabitants except for blond-haired blue-eyed bloodsucking devils. COS are training them on TR:s and Comm Course. I’m not getting excited until the Rastafarians are inducted into the flock. Then D.M.make Ganja OK for Scientology or an endless rundown with no EP. WOW. What happened to the obnoxious “everyone is expected to be there” or the dictated “required to attend” or anything else “you have to/need you to” in respect to events? Focus has now changed to “undesirables” away from the “1.1 money machine”? My guess is that statement was for NOI members. If they invite Rinder so they can see what a real SP looks like, I’ll go too and I’m sure there will be quite a large number of people that would happily join and *then you will see the highest ever attended graduation! You are right, this is a typical covert, veiled slap on other staff members that will fit best to be the Chairman at Graduation, specially at PAC. But none will notice as is another lie placed in front of their eyes to PR how Scn is expanding in other religions. Interesting also the quote re you can attend even if not on course; does this mean you have to be enrolled on a course to attend graduation? I even doubt God knows the answer as by not the church is just a web of lies. etc. I mean auditor training, not Div VI courses. Hell the whole thing is a joke these days. completions. Took maybe 45 minutes, sometimes less. Couple of questions. What ever happened with all of the Buddhists who were coming to CCI several years ago? Seems CC was wining and dining them quite a bit. From everything I’ve read, the NOI are quite fixated on the idea that the black race is superior and whites are the bane of the earth. How is it that they are using a white man’s tech? Or do they believe Ron just had bleached skin? Last question, is anyone else having trouble getting on to Tony Ortega’s blog? I can’t get a connection. I forgot to mention – the NOI members that joined staff in 2009-2010 that BLEW have “freeloader debt”. A staff member actually told me when I inquired about an NOI guy that joined the staff in the local Org – “Muhammed can come back when he has paid his freeloader debt”. When I was in – the staff told me NOI were “hands off” of regging them for anything! Any ideas about numbers of NOI on staff? One? Five? Ten? Fifty? Another good post Mike and thank you! From what I hear – NOI is pretty much NON-E in the Orgs these days. IN fact, the few NOI members that joined staff BLEW and are in “treason”. I also have heard that the merging of Dianetics with NOI is busting up NOI – most members are not happy – they LOOK at the internet and can’t believe their “leader” has taken them off the cliff merging with the Cult of Scientology. NOI will get smashed by their involvement with Scientology. Everyone gets smashed! This is a no-brainer predict! “The Nation of Islam is going to be doing Dianetics.” .Are they now a franchised mission or group and therefore “licensed” to use e-meters and copyrighted materials? They have academy trained auditors, so I think they are authorized to use copyrighted materials. This Dianetics-only bridge is unfamiliar to me, but I don’t think it includes e-meters. I hope these photo links work. Oh, they also use Study Tech and promote Applied Scholastics. Those guys with the certs look hypnotized/tranced out. Rod, is this the Inglewood org in the second picture? Or Harlem? And, yes, Madora, all three looked out of it! Spooky, in fact. Leila Wills has done excellent coverage of the unholy alliance. Google “Leila Wills”. Brother Muhammad Miscavige can’t find enough ways to make Scientologies PR worse, if that is even possible. Can I get an amen?!!! Also, I believe Tony Muhammad would be correctly described as a “student minister” because the Nation only has one Minister, the Hon. Louis Farrakhan. Thanks Rod. I see stories and coverage about him calling him Minister but what do I know…. You have obviously studied this a lot more than I have and I have no doubt you are correct. Your explanation of matters NOI is very helpful. Thanks for taking the time to comment. It’s helpful to everyone who visits here. Ishmael Bey is a critic of the NOI getting involved in Scientology, and will be speaking at Flag Down in May in Clearwater. I look forward to seeing his talk. His group on Facebook is Scientology Invasion of the Black Community. I finished my intensive and decided to join the NOI. Thank you LRH and of course thanks to RTC and the bestest and most great leader of all time David Miscaviage!!! Praise be to Allah and to LRH!! Praise be to Allah and LRH!!! I don’t think Allah called outsiders “wogs”. I follow NOI as much as I can. There are several things going on. The first is that there was a small revolt when Rev. Farrakhan announced they would be doing “Dianetics.” They are being told that they are not doing “Scientology” but only Dianetics. Even with this qualification, they lost quite a few people because some see this as not following the teachings of TMH (the most honorable) Elijah Muhammad. Rev. Farrakhan announced that anybody who didn’t want to do Dianetics would not be able to continue in the Nation of Islam. Disconnection, in other words. The coordinator between the two appears to be Rev. Alfreddie Johnson, who has been introduced and embraced by Rev. Farrakhan on stage. Auditing in the NOI has a more spiritual aspect than in Scientology. They are told that they are exorcising demons through auditing, like Jesus did. Yes, NOI and Islam in general know about Jesus. The Bible is quoted regularly in NOI mosques. I think the bait and switch is that they are not just doing Dianetics. They are doing Narconon, CCHR promotions, and the Purif. I suspect there will be Scientology levels after they go clear as well. The cosmology of the two groups is very different, and it will be interesting to see how that plays out. Scientology has the space opera thing, but that’s only available to a few members. Mars implant stations, spacecraft shaped like airplanes, the galactic confederation, etc. The NOI has “The Wheel.” This is a large spaceship that is currently orbiting the Earth, with TMH Elijah Muhammad and Master Fard Muhammad (the Mahdi) on board. This is the same wheel that Ezekiel describes in the bible. It is a mother ship with thousands of smaller ships inside it. When the time comes the small ships will come out and cover the earth in fire up to 12 miles high, except for places that follow Master Fard Muhammad. This information is not secret, it is broadcast, printed, and promoted to everybody. I think there are more NOI than there are Scientologists, but it’s pretty close. I don’t know who will be affected more, the NOI by Scientology or Scientology by the NOI. scientology also has this thing about Jesus and Muhammad being implants, just made up stories. there’s a cover of some pamphlet that shows hubbard on a mountain top or something, with Jesus, Muhammad and other leaders climbing up towards him to be received. weirder don’t get no weirder. Rod, thank your for the accurate summery of the unholy alliance between the COS & NOI. Fascinating. Thanks for that info Rod Keller. Two lunatic systems of belief feeding each other = insanity squared. Scientology can claim that the “Wheel” is the predicted next invader force sent by the Marcabs or whatever nut jobs hold grudges for millions, billions, and even trillions of years. Or maybe the Wheel is filled with good guys waiting to fight off the next invader force — maybe staffed by the Loyal Officers. Scientology can also offer demon cleaning (getting rid of BTs), and if you really get it together, they can teach NOI to exteriorize and go visit the Wheel whenever they want. And what can NOI give Scientology? Mutual support of minority, fringe, religions? Maybe a bit. But probably mainly, money and new membership. Actually, Scientology could probably grow faster by curtailing all its other schemes and just asking its current members to reproduce with abandon and indoctrinate their children. However, I personally do not believe that any child should be indoctrinated into any religion. Let them decide as adults. So, NOI and Scientology, strange bedfellows? No. Birds of a feather. May I ask where / who you got this information from? 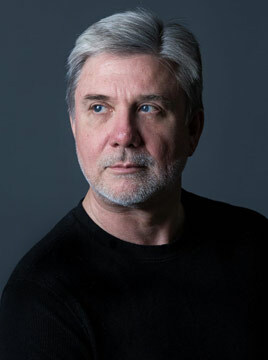 (Rod Keller commenting on a blog written by Mike Rinder – who would have thought it? I like it! 😉 ). Seriously, for anyone who would like a quick peppy introduction to the history of NOI, I recommend “FARRAKHAN, The Movie” by Leila Wills. in trying to adequately describe the developments between NOI and scientology, i have concluded that new words need to be invented first. current words fail.